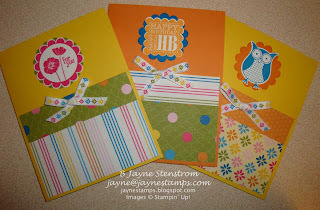 Here are the cards that the ladies made at my Stamp-a-Stack class last week. Everyone made three of each design but customized them with whatever saying they wanted. We had a great group here and there was a lot of laughing and having a good time! This first card is very easy. 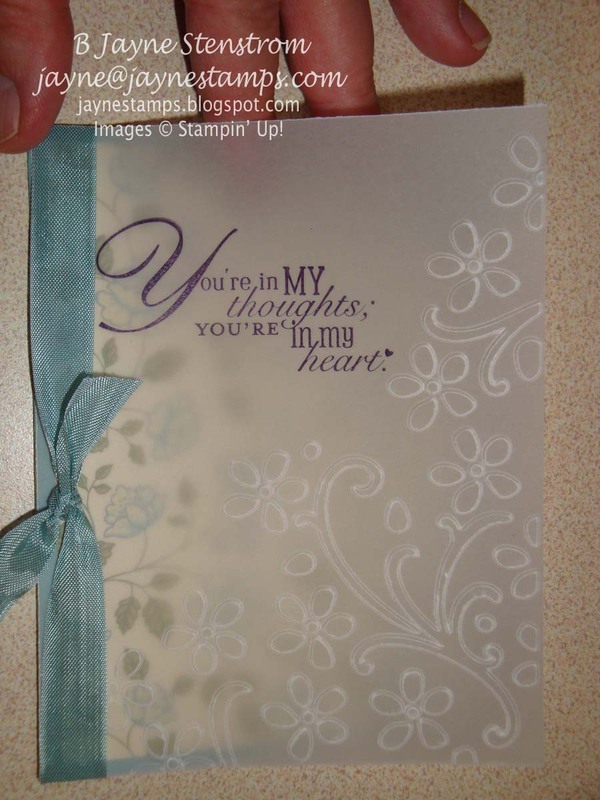 The Whisper White cardstock was cut in half to 4-1/4" x 11" and folded. The colored cardstock was cut into 4-1/4" squares. We then ran that through the Big Shot with the Vintage Wallpaper embossing folder. 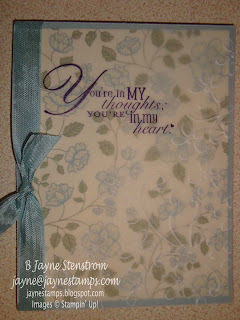 The saying was stamped in the lower right hand corner, and then some 5/8" Satin Ribbon (pg. 191 IB&C) was added. 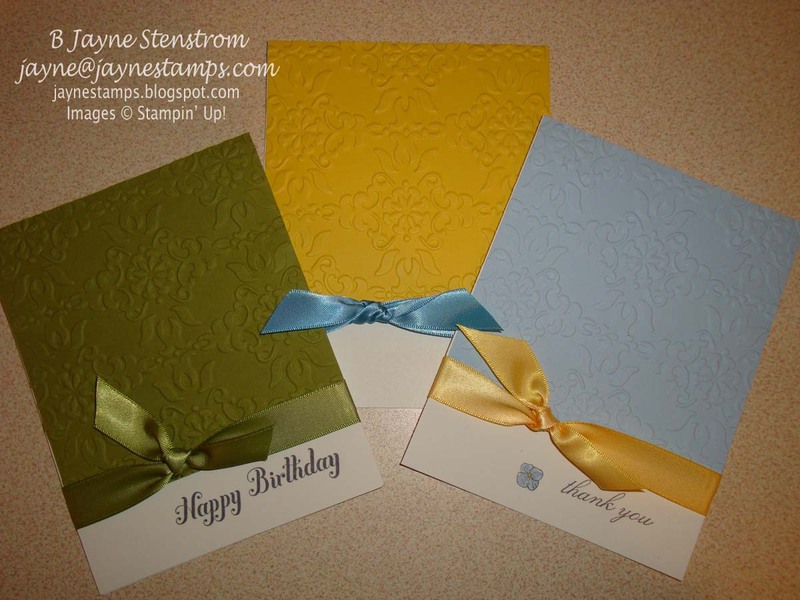 They could make them monochromatic like the one above, or mix up the ribbons and cardstock. 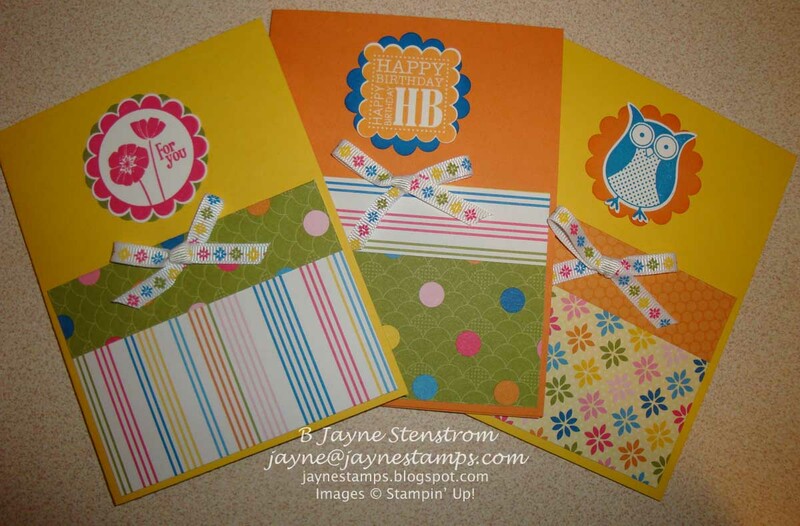 These next cards used the Punch Bunch stamp set from the Sale-a-bration catalog. We also used the Ice Cream Parlor DSP & Quick Accents Pack and the Ice Cream Parlor ribbon available in the Sale-a-bration catalog. This is the last time you'll be able to get this stamp set or accessories. If you don't get them by March 31, they will be gone forever! 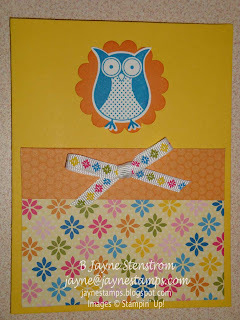 This simple but beautiful card idea came from Gretchen Barron. It's cardstock with some DSP attached and a vellum overlay. 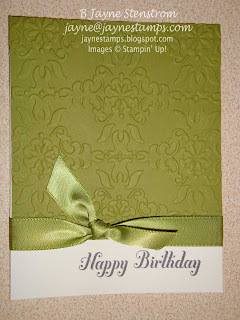 We used Cardstock Vellum (pg. 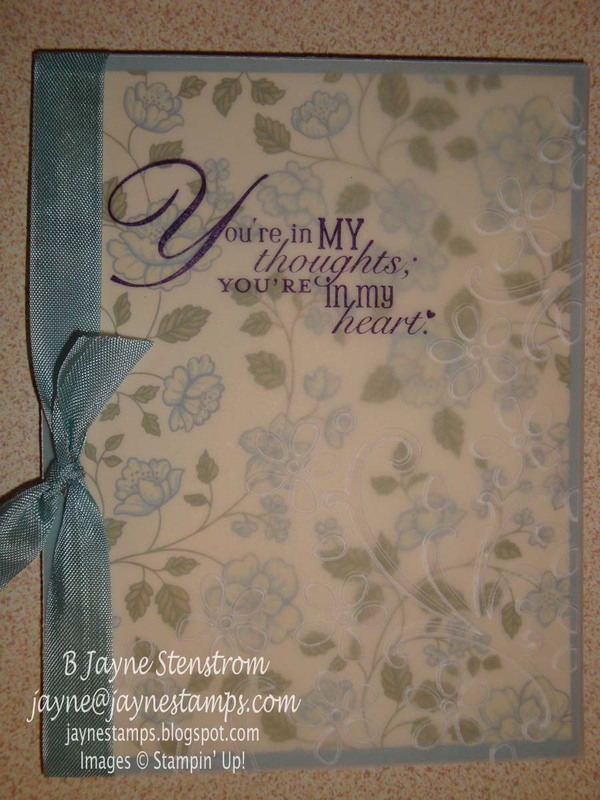 170 IB&C) and ran it through the Big Shot with the Elegant Bouquet embossing folder. 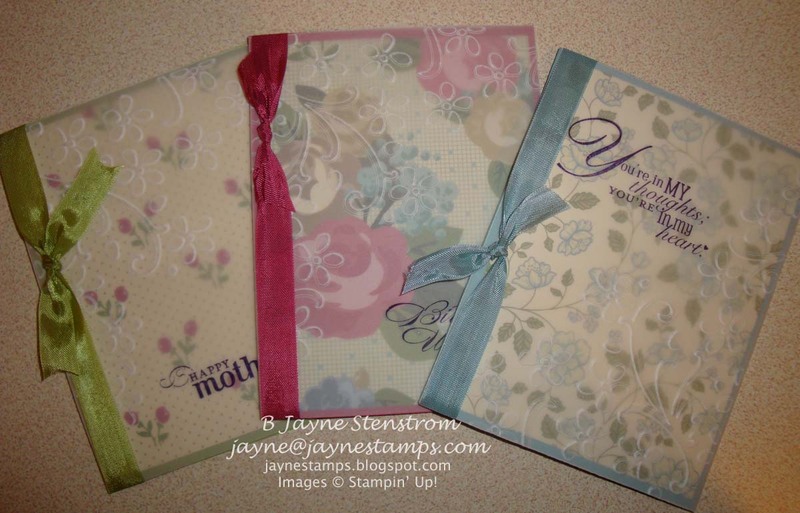 We used the Springtime Vintage DSP from the Occasions Mini catalog (pg. 15) with coordinating cardstock and 1/2" Seam Binding Ribbon (pg. 16 in the mini catalog). The vellum is attached with a strip of SNAIL down the left hand side and then the ribbon is tied around the front to cover the adhesive. Here are the three finished cards. These look so nice in real life and are a wonderful idea for a quick, beautiful card when you're in a rush. 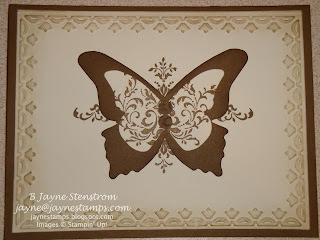 The last card uses the Beautiful Butterflies Bigz die (pg. 206 IB&C) and the Framed Tulips embossing folder along with the Sale-a-bration Bliss stamp set. The colors used are Very Vanilla and Soft Suede. This is the only card that they made all the same color. I got the idea from a swap card I saw at the Tickled Ink meeting last Monday. I had been trying to come up with an idea using the Bliss stamp set and butterflies but wasn't having much luck. When I saw this card at the meeting I knew it was exactly what I was looking for! Thanks for the idea Sharon! I couldn't resist showing you how Webster ended the evening. He decided to make himself comfortable on the couch downstairs. (This is in the same room that I have classes.) 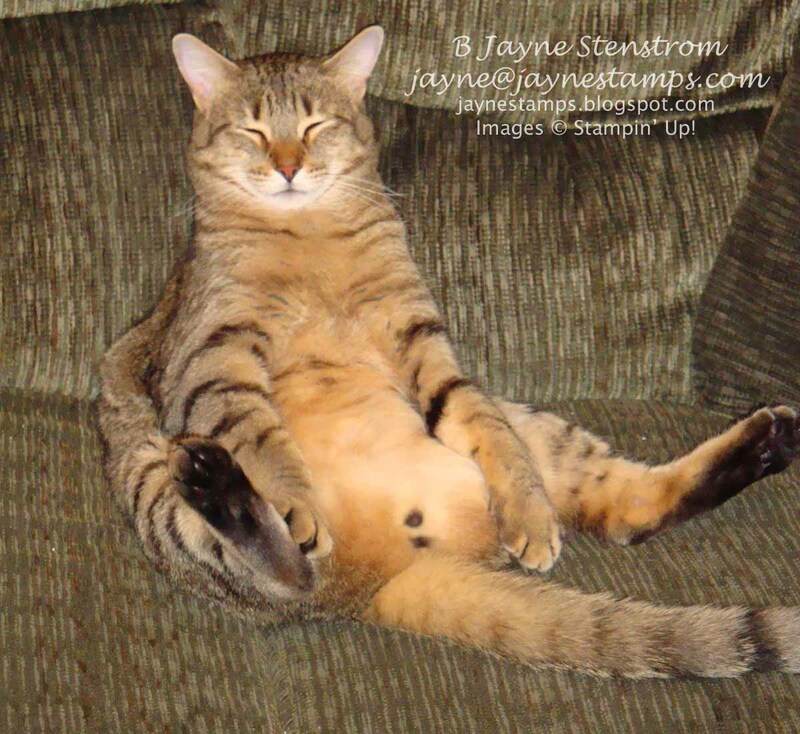 Does he look relaxed or what? Guess he was tired out from watching all the stamping going on.